The most unexpected result of this study, though, was that the more positive results found for compassion had important methodological flaws—compassion levels in some studies only increased if the meditation teacher was also an author of the published report. Their research—published today in Scientific Reports—only included randomised controlled studies, where meditators were compared to other individuals that did not meditate. "To understand the true impact of meditation on people's feelings and behaviour further we first need to address the methodological weaknesses we uncovered—starting with the high expectations researchers might have about the power of meditation." Can meditation make you a more compassionate person? The point of meditation in Buddhism isn't that the meditation itself should do anything. Buddha explicitly warns you against that idea. Mediatation is a means by which you empty your mind of preconcieved notions in order to evaluate the teachings and realize their truth - of non-adherence and non-reliance on preferences, perceptions, ideas, and the illusions and "mental fermentations" that arise out of them to produce the sufferings we experience in life. 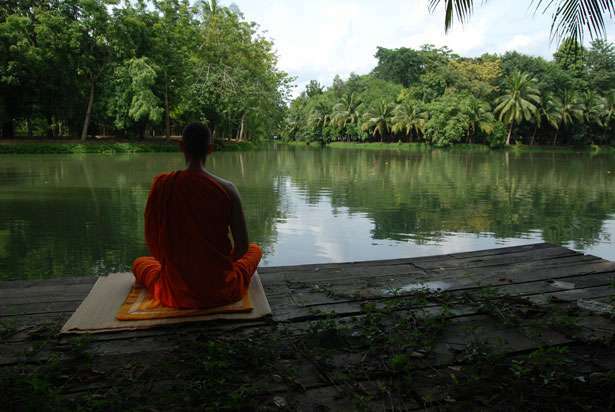 Doing meditation without contemplating the Dhamma is just sitting with an empty mind, or amusing yourself with a type of sensory deprivation that puts you into funny moods or hallucinations and self-hypnosis. It's basically a waste of time. That is exactly right. Meditation in itself, not properly applied, really does not go anywhere. Meditation is part of a path, it is not a destination. Our modern world is designed around the idea of ego enforcement, ego repetition, ego expansion. Ego reflection and noise in increase and permanence. Exactly the wrong direction that would help a person. Think of the ego as a self running program that is put in place to be used until the real owner of the avatar can grow away from being the egoic child, and can finally step up and become the full being. Removing/calming the ego from the controls of the avatar is supposed to be difficult, as the avatar and the reality, is no mere toy. "Doing meditation without contemplating the Dhamma is just sitting with an empty mind, or amusing yourself with a type of sensory deprivation that puts you into funny moods or hallucinations and self-hypnosis. It's basically a waste of time." Pliancy from an improved default network mode, slowing brain age, or opting out of being brain raped (https://www.bigge...en.com/) is not a waste of time. There is no such thing as time wasted. Depends on what you're trying to achieve. Yet meditation has the opposite effects if you contemplate on falsehoods and further hypnotize yourself into it. others meditate to improve themselves, which confuses and hinders them - it's not the point, and can't be attained because the thing that's supposed to be improved hasn't got the power to; one teacher put it as "touching the tip of this finger with the tip of this finger".